Latifah Salom’s novel, THE CAKE HOUSE, is just as delectable as the title suggests. That's not to say that this novel is purely a sugary sweet read. Salom’s debut is a veritable mixture of mystery, ghost-story, and coming of age. From the beginning, the reader is ushered into the “Cake House,” a vast pick structure in the hills of Los Angeles, through secrecy. Rosaura Douglas’s father has just committed suicide and now, she finds herself trapped with a new stepfather and stepbrother in the house where her father perished at his own hand. But did he really commit suicide? As Rosaura begins to see her father’s ghost, this is something she must discover. Yet, through each interaction, it is not so much an unraveling of Rosaura’s mind that is presented. This never feels like a story told from an unreliable narrator. Quite the contrary. I trusted Rosaura and her story completely. She is a narrator on the cusp of discovering what it means to grow up and she must do so quickly as she tries to reconcile her life before and after the Cake House. Latifah Salom breathes life into the halls of Rosaura’s new home and it becomes a type of character throughout the rest of the story. Hidden in its gardens and walls are secrets that Rosaura and the reader must discover together. Her father’s ghost warns against her new stepfather, Claude, while making her live through his own memories. The narrative weaves through stories from the past all while taking Rosaura through love, high school, and everything else that comes with a coming of age story. Much as the best books do, THE CAKE HOUSE complicates Rosaura’s life in more ways than one. Once poor, Rosaura has to learn to accept Claude’s wealth and control over her life. She has to navigate burgeoning love with her responsibilities to her new family and her old life. All of this is presented with an unflinching attention to detail similar to other contemporary novels by authors such as Ellen Hopkins and Stephen Chbosky. Salom’s narrative is lush and lyrical and so beautiful that even through the gritty nature of the story, the writing is still mesmerizing. Rosaura’s life is never glossed over, nor is her character. She is imperfect and flawed along with the other characters who reside in the Cake House. This is something that marks her as someone worth 336 pages of the reader’s time. This story mirrors Shakespeare’s HAMLET in the most twisted and terrific ways and will appeal to even those who fear the tragedies penned by William Shakespeare. Much like any Shakespearean tragedy, in THE CAKE HOUSE, nothing is perfect, no one is safe, and one fatal flaw can be enough to undo everything. At times Rosaura’s story is heartbreaking, the characters shifting between weakness and then gaining strength from such vulnerabilities. And while this is a tale of darkness, light, and the places between, it is truth, hope, redemption, and ultimately love that are left sprinkled around this “Cake House”. Because this book skillfully mixes mystery, romance, ghost-story, and coming of age into one delicious novel, it is something that is sure to please anyone. 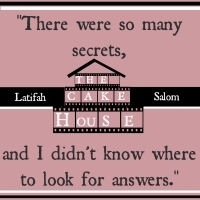 So pick up Latifah Salom’s debut novel, THE CAKE HOUSE, today! "This book... there aren't enough positive words to say about it. The story: Moving is the worst, but when..."